What do you make for dinner when the calendar says October, but the weather screams SUMMER. Seriously, guys, it is going to EIGHTY DEGREES today. While I am totally craving all my fall favorites (apple crisp, pumpkin bread, these stuffed acorn squashes), I simply can’t shake my need for cool, crisp dinners to combat the weather. This salad is cool, crisp, and unfussy (just how I like my summer eats), but is loaded with all the delicious fall harvest goodies! So basically it’s the best of both worlds. The salad is probably the easiest thing to pull together because it utilizes things that you probably already have in your fridge/freezer/pantry. I start with a layer of mixed baby greens – I love the mixes that have baby spinach, baby kale, and baby arugula along with other baby lettuces. I feel like it gives good texture and flavor to some of the more mild baby lettuces. On top of the greens, I layer grilled chicken (from my freezer! ), cooked beets (from one of my favorite company ever, Love Beets), chopped apple (I used a honey crisp apple here, but any sweet/firm apple will do), and some chopped pecans! 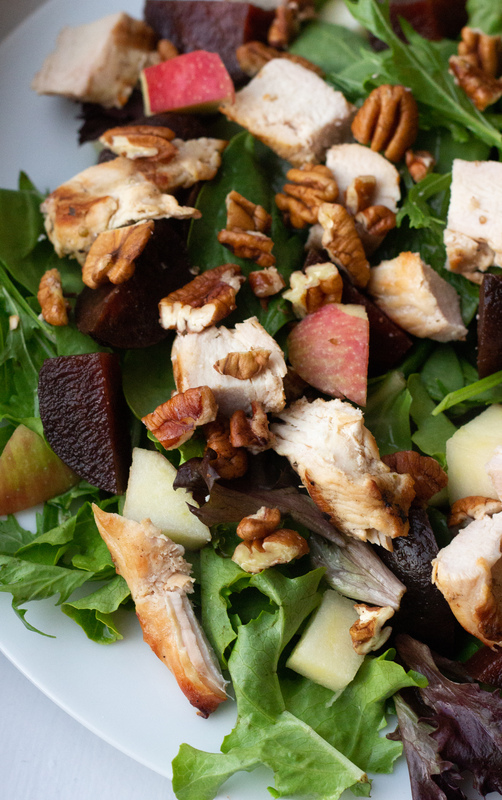 It’s savory, sweet, soft, crunchy, earthy, and refreshing all in one salad. I top the whole thing with my Basic Salad Dressing that I use for EVERYTHING. Because it’s the best. And it’s easy. And it uses ingredients found in your pantry. Plus, the mustard element really plays well with the chicken and the beets! This salad is the best of two worlds – the easy dinners of the summer with the bold flavors of the fall! It’s the perfect weeknight dinner winner. Fresh salad greens are topped with all the flavors of fall! Combine all dressing ingredients into a jar with a tight-fitting lid. Shake the jar vigorously until the dressing is completely combined. Set aside as you assemble the salad. On a large plate, arrange the salad greens. 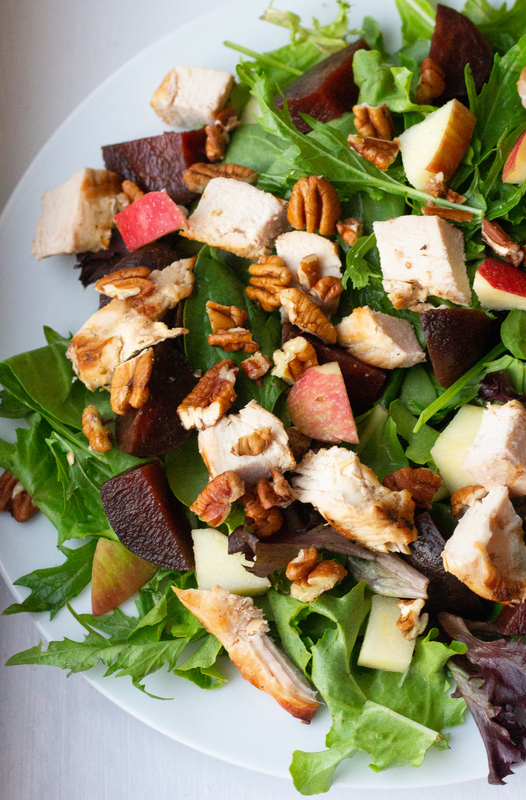 Top the greens with the chicken, apple, beets, and pecans. Drizzle over the dressing and toss to combine.